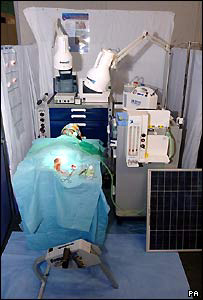 A £25,000 solar-powered portable operating theatre which can be set up within 10 minutes has been unveiled by its Kent inventor. The "hospital-in-a-box" can also run on pedal power and be used in developing countries and disaster zones. The CompactOR operating theatre was invented by Alexander Bushell, 45, who is a design engineer from Medway. "I got the idea... travelling around Kenya and seeing how people lived there," he said. There is space for two surgeons at a time in the portable theatre, which can be flown into disaster zones by helicopter. It contains all the equipment found in a normal operating theatre, including a defibrillator, ECG monitoring, suction, an anaesthetic machine, and surgical lighting. Doctors have flown out to Africa to drum up support for the award-winning invention, where it is due to be launched on 6 December. Mr Bushell, from Sittingbourne-based Global Medical Systems, created the "pop-up" operating theatre with his partner Dr Seyi Oyesola. He claims it is the first of its kind in the world. "Originally I'd spent a lot of time in Kenya and obviously in some of the small rural villages they have absolutely nothing at all - not even a simple defibrillator. "On many occasions we found that there were emergencies that could have been quite easily dealt with with just a defibrillator on its own - so that's where I really came up with the idea," he said.